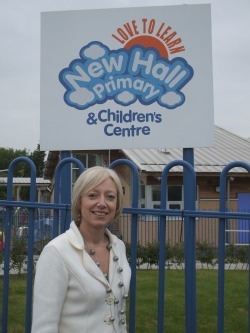 I am delighted to welcome you to New Hall Primary and Children’s Centre website. As Headteacher I am proud of how all members of the school community contribute, to make New Hall such an exciting place to be. The children, staff, parents and governors at New Hall work really hard. Please browse to see the fantastic opportunities that are offered here. I would welcome your comments or any suggestions as to how we can improve the site, so please feel free to email me at enquiry@newhall.bham.sch.uk.